My volume of the new Oxford Burns edition, Commonplace Books, Tour Journals and Miscellaneous Prose, was officially published on 31st July. I was thrilled to receive my copy on the 10th August 2014, just a few days before I set off for Mexico, where I am spending the remainder of my sabbatical leave, writing the first chapters of a new research monograph. Oxford University Press has done a beautiful job on the volume, and even its rather austere blue cover gives it a certain dash. Oxford’s proof- and copy-editing team have also put in a lot of work, chasing down inconsistencies and editorial slips in the submitted typescript. I’m pleased with the frontispiece of ‘Robertus Burns, Scotus’, from the Glenriddell Manuscripts, showing Burns in Riddell’s library at Friar’s Carse, surrounded by various significant objects like the mask of comedy, a shinty stick, and a ‘stock and horn’, along with a musical notation of his ballad ‘the Whistle’, which featured Riddell in an heroic role. I wish the tours maps were a bit bigger and more legible, but interested readers can access them on the CRBS website in full colour, and we’re planning to make them clickable, so that they’ll yield up images and information on places visited and described by Burns in prose or verse. I’m really grateful to Chris Fleet, Senior Map Curator, and Daniel Henrie, of the National Library of Scotland, Edinburgh, for preparing these maps for the Borders and two Highland Tours. I started editorial work in 2010, so it’s been quite a long haul, perhaps only to be expected from an edition weighing in at 432 pages, with 112 pages of endnotes. The work was funded by a generous grant from the AHRC, permitting me to take Friday’s off from my duties as Head of the School of Critical Studies at Glasgow, and rediscover the pleasures and sometimes frustrations of academic research (my research day of course spilled over into the weekend, so I have to thank my family for their patience as well). From the start my research assistant Dr Pauline Mackay was a fantastic help, painstakingly transcribing each of the manuscripts, and other texts: I don’t know what was more valuable, her rigorous eye for decoding cryptic words in blurred or blotted manuscript, or her air of steady calm. The editorial team (Gerry Carruthers, Murray Pittock and Kirsteen McCue) were also an endless fount of information and expertise, helping me to track down obscure references in Burns’s commonplace books, or access publications that no one else had heard off. There are a number of surprises in the volume, not least several pages of Greek transcription in Burns’s handwriting, from one of his excise notebooks. So much for the ‘heaven taught ploughman’! One of the still unsolved mysteries is the identity of ‘W.R’ who annotated Burns’s First Commonplace Book, at the poet’s own request, helping him select material for publication in his landmark Kilmarnock Poems. After taking this to the press in July (BBC news and some of the national broadsheets) I was bombarded with suggestions, but despite some excellent hints, there were no conclusive answers to the riddle. So the hunt goes on. 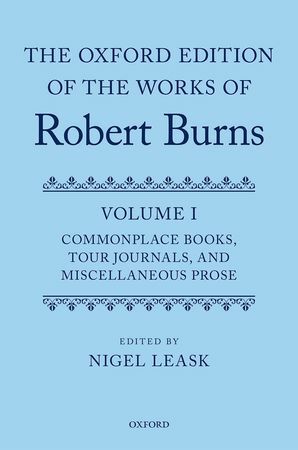 I hope that readers will enjoy the volume, and find Burns’s prose writings as full of pleasures and surprises as I did. It will certainly cast new light on Burns’s poems, which have enthralled readers for over two centuries, and hopefully encourage both students and the general public to read more widely than the two or three poems that are in most people’s minds.